The Have Fun Teaching web site has just released a brand new CD, "Songs for Kids," and it is available on iTunes, Amazon, Rhapsody, Napster and other online music stores. These songs for teaching are exactly what kids need today. Have Fun Teaching is a free web site for teachers, home school, and daycare providers that offers high quality worksheets, coloring pages, flash cards, songs for kids, fun activities and games, learning centers, teacher tools, blog for teachers, facebook for teachers, and so much more! 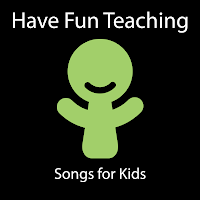 The brand new CD released by Have Fun Teaching on September 2, 2009 is called, "Songs for Kids." There are 18 songs for teaching on the album with kid favorites such as, "Hey Bully Song", "Noun Song", "Respect Song", "Days of the Week Song", and the "Verb Rap Song". Your kids and students will be singing these memorable songs and dancing their way to an A! All of the songs by Have Fun Teaching can be purchased online through iTunes, Amazon, Rhapsody, Napster, and many other online music stores. With an overwhelming response from the first album, I am already working on the second Have Fun Teaching album that will focus on Character Education Songs. I feel that there is such a need to build positive character in kids these days. There are so many great beats and amazing music on the radio today, but the lyrics are horrible and send the wrong message to the next generation. My goal is to take the hip-hop, dance, pop, and rock styles of today and add some fresh, positive, educational lyrics to them. Have Fun Teaching is making huge strides in the online teaching community by collecting nearly 600 new Facebook fans in the last 2 months. The Have Fun Teaching web site alone generates thousands of hits per day with new and veteran teachers, home school parents, daycare providers, and even kids. The Have Fun Teaching website is updated every day with new content, blog updates, twitter updates, and facebook communications.